Jamaican Dancehall music has always maintained the Afro-Diasporic aesthetic of having a distinctive voice. This voice does not merely relate to content but the sound of the voice. Here is a Top 10 of the most distinctive voices in Jamaican Dancehall. Tiger was one of the mid 80s Dancehall dons. Tiger’s unique self call-and-response, where he goes between a broad pronunciations and a deeper clipped tone, is not only humorous but terribly unique. He also possesses one of the most elaborate speaking/chanting styles you will ever hear on a stage. If that was not enough, he also uses his call phrase, “see!” copiously. In the early 90s Shabba Ranks was possibly the biggest name in Jamaican Dancehall. Shabba gained cross-over success with his Mr. Lover track which replaced the Dancehall reggae beat with a generic back beat. However, I have chosen the seminal “Dem Bow” tune which started a whole genre to showcase his unique vocal. Shabba brings a deep baritone and an aggressive attack to his chanting. He also has surprisingly clear diction especially when compared to other Dancehall artists. From the modern brigade we have Vybz Kartel who has a school of Dancehall performers who implement his template of low chanting and contrasting higher pitches between sections. 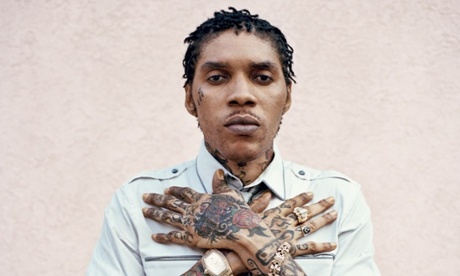 This style makes Vybz Kartel distinctive and a solid member of this list. Sizzla brought a distinctive lyrical voice to Dancehall in mid-90s. As a Rastafari from the Bobo Ashanti mansion, Sizzla set about inserting his ideology which at the time was largely relegated to Reggae. Sizzla also brought a new approach with a singing chant style that used double-time rhythm and falsetto singing. As time went on, Sizzla utilised more of the falsetto and remains one of the most recognizable voices in Dancehall. Eek-a-Mouse was one the early 80s Dancehall performers and a contemporary of the more famous Yellowman. With his nonsense syllables and a nasal voice, Eek-A-Mouse set himself apart in terms of sound. Although not original in terms of sound, the idea of chanting like Snagga Puss the cartoon character, is a stroke of genius. With a speedy vibrato like the character and a quick rise and descent pitch at the end of each word, Snagga Puss scored some moderate Dancehall success in the late 80s and early 90s. Needless to say, his lyrical content was mostly far from serious. Here is another of the post 2000 Dancehall artist. Mavado and his call, “baby” are as well-known as his singing come chanting style. Unlike Sizzla, he does not use the falsetto, instead Mavado engages in what can only be described as a whine where he constantly slides into notes like if his fingers are caught in a door. His success shows this style pays off however. In a space dominated by men, a female voice would of course stand out. Lady Saw is easily the premier female voice in Dancehall and has been for quite for a while. She also is very rhythmically secure with an attack and ride of riddim that is as good as any. In the earliest days of Dancehall this toaster was the man. With an elaborate speaking style that doesn’t always reflect a Jamaican accent, U Roy was a pioneer and is still distinctive some 40 years after his initial success. Tommy Lee is the youngest person on this list. Due to the fact he emerged so late in a genre of so many great and unique voices, he took it upon himself to be as extreme in terms of sound as is possible. From an extremely nasal voice, to a guttural sound and an elaborate style like Tiger, Lee does it all. The combination is not to everyone’s taste, especially the older Dancehall heads. However, Lee has marked a space for himself and no one sounds like him. Remember, can’t include all!! Who are some of yours? The video below is part of a series which looks at the Carnival/Crop Over music industry machine. This one speaks about new artists. Enjoy!